A fascinating and enlightening weekend was enjoyed by those attending the AKC-CHF Parent Club health conference in St. Louis, MO August 9-11. Thank you to the AKC-CHF and sponsor Nestle Purina for hosting such a fun, educational, informative and classy event! I was able to attend many presentations on new gene discoveries and gene testing/diagnostics available and coming for our dogs. In addition, I learned about new treatments and therapies including stem cell therapy for injuries, certainly not my area of expertise but absolutely fascinating and exciting for the future of dogs and man! Something I noticed from many attendees with regard to new genetic testing were many questions and a seeming frustration and/or concern about what to do with this new information - namely what does a dog "with the gene" mean for the breeding of that dog? One thing that people were told was that dogs may have a dominant gene and in turn have the potential to produce affected puppies, but that they should be concerned about the "gene pool" and about removing dogs with the gene from breeding, especially if a large percentage of dogs in the breed have the gene mutation. Huh? That defies all intuitive reasoning and is not how they have been told to approach genetic disease in the past. Knowingly running the risk to produce affected puppies? That is irresponsible, right? And we are nothing if we are not responsible breeders! Many breeders are terribly confused about what to do. With regard to a dominant gene mutation that has been identified and is common in a breed (a woman behind me said, "I am sure glad I do not have that breed"), but the reality is that all breeds probably have some form of dominant condition that needs to be addressed, it just has not been identified yet. This also means that cross breeds and mixed breeds have a risk for these types of problems but cannot be predicted and difficult to address or eliminate in dogs with unknown ancestry. This is where "Genetic Counseling" comes in! Genetics is not easy and the "right" thing to do is not always as intuitive as it would initially seem to be, especially in dog breeding. For generations, people in the dog world have been told to shun genetic disease. They have been told that genetic disease is "bad" and that it should mean the death of a breeding program. This may at least partly be because there was not a great understanding of genetics by the veterinarians who were diagnosing the disease. This is not the veterinarians' fault; they were not taught how to ask about family histories, interpret genetic testing, how to conduct breeding programs or make breeding decisions. They were taught to diagnose and treat disease. When dealing with a sick dog, it certainly seems obvious to say if this MIGHT be genetic and could be repeated, let's not do that again! Let's not breed this dog, the dogs that produced this dog or those relatives that might also be at risk to produce puppies with this problem. As a result, breeders were often told to remove the affected dog, their sibling, their parents and any offspring from the breeding program, often for a condition that MIGHT be genetic. It would be the only "responsible" thing to do-right? Many breeders and breed clubs were happy to pick up this torch and being "responsible and caring" they would eliminate and champion the elimination of genetic disease. People would point at genetic disease, call it bad, something to be feared and eliminated, often with a sledgehammer of an approach to the breeding program, the line of dogs and/or possibly the entire breed's gene pool. Everyone recoils from genetic disease. The first thing that both grandmothers in a human family say when a genetic disease is diagnosed in a baby is "that did not come from our family!" The unfortunate reality is, genetic disease is inevitable. Much of the time clearly identifiable genetic disease is tragic and heartbreaking like Rigel's story illustrates, but it is nevertheless still inevitable. People will say "But I can't experiment with genetic disease". Technically, reality is that every time a couple has a child and every time someone breeds a litter they are running a genetic experiment that comes with a risk to produce genetic disease. I would love to be able to help people do things in a way to guarantee that they have a healthy baby and breeders do things in a way that would guarantee that they only have perfect and healthy puppies, but that is just not how genes and reproduction work. Every living creature carries the potential to produce and develop some sort of genetic disease. It has been estimated that each human carries at least 3-5 lethal equivalent alleles (1) while others have estimated as many as 100 (2) and still others estimate that each human has 500-1,200 negative mutations (3). Add to that that genetic change is part of the process. Change is what allowed evolution to occur and new species to be created. Change is what allowed for the great diversity of size, shape, appearance, color and probably even behavior that makes each breed unique. That same change is where genetic disease comes from too. Even if all genetic disease could be eliminated tomorrow, new genetic diseases would crop up with an estimate that 1.6 new mutations occur per human per generation with one canine study suggesting that the new mutation rate of dogs is actually greater than that of other species (4,5). These realities will lead many people to say “well it is all a crap shoot” or dissuade some from having children/breeding at all. This is not realistic either. The key is to accept the reality that genetic disease can occur but to use the many tools and information available to minimize, manage, control and in many cases potentially even eliminate certain genetic diseases. This can be done with a combination of genetic testing and the understanding of genetic principles. Over 6,000 genetic diseases have been documented in humans. This is most likely because humans are the most scrutinized and the most studied. Dogs have about 600 identified genetic diseases. Again, this is most likely not do to the fact that they have more genetic disease, but that they are in a position to have their genetic disease recognized, studied and identified. It is through this recognition and identification that genetic disease can be managed and controlled, but this control must be approached carefully. The benefit of dogs with known ancestry allows breeders to know the risk and have specific testing available to minimize that risk. Just as a person can know some of their genetic risks based on their family, people can know a dog’s genetic risk based on their breed and knowledge of the health of the dogs in the pedigree. Breeders must take care not to limit the gene pool in the process of breeding choices or their attempts to eliminate genetic disease with this new understanding that another genetic disease always has the potential to lurk around the corner. Related to breeding choices, there is a tendency in the dog world to determine that a certain male or a certain line is "perfect" or nearly perfect and to breed that dog to the exclusion of others (popular sire). They are trying to do the right thing with a desire for perfection and "improving the breed". But in genetics, there is no such thing as a perfect dog and that dog's negative gene mutations will inevitably surface and become a problem. Alternatively, dogs that are known to carry a negative gene mutation also have good genes and diversity to give to the breed, if they are excluded in mass numbers, then no doubt other negative genes mutations in the breed will be increased and become a problem. It is a head-swimming balance that must be struck. But with an understanding of some basic genetic principles, and some careful breeding choices, genetic testing can allow breeders to take a careful, more surgical approach to removing a genetic disease while maintaining all of the potentially important genes that provide positive genetic contribution that those dogs have to offer. It is also important to begin to recognize and manage emerging genetic disease when the issue is still uncommon in the gene pool. Paw Print Genetics can provide breeds and breeders the tools to begin to make these decisions. (1) Morton NE, Crow JF, Muller HJ An estimate of the mutational damage in man from data on consanguineous marriages. Proc Natl Acad Sci U S A. 1956 Nov; 42(11):855-63. (4) Lohmueller K E, et al. Proportionally More Deleterious Genetic Variation In European than in African Populations Nature. 2008 February 21; 451(7181): 994–997. (5) Laidlaw J, et al.Elevated basal slippage mutation rates among the Canidae.J Hered. 2007;98(5):452-60. 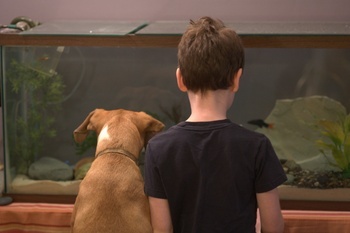 Maple & Jack watch fish, CC courtesy of Michael Netwon on Flickr.